Dearest Readers, thank you very much! October was the 4th highest traffic month for TPP ever, although TPP has yet to break the 20,000 hit barrier, and that was even with only one Friday fabulous flower. Perhaps TPP should have a cocktail party and invite you all. And here's a gift, up coming, the Phactors have revised, and devised, a very successful modification of a vegetable (actually fruit) lasagna. So as soon as we get the details all correct, it will be passed along to you all. Lately TPP has had some travails about book art, his, and their subpar resolution, which will take some effort to correct. Ah, well. So it was with some amusement that this article on "book art" was noticed. Here's another artist doing something whimsically creative with old books, in this case Lisa Occhipinti. Some time back TPP posted a blog showing book art by Brian Dettmer. And not too long ago TPP noticed another book "carver", an artist named Guy Laramee. One hopes that his carving of Petra (?) is from an encyclopedia of archeology or ancient history either of which would be appropriate. Now if only TPP can publish a book so as to carve the unsold copies. Yesterday morning a huge leaf cleanup task filled the Phactors' lawns. TPP use to rent a beast of a machine, the Billy Goat, to vacuum and chop leaves, but at times you could only clean an eight or ten foot long swath before the 8 cubic foot bag was full. The problem was that each time you stopped the beast to empty the bag, no small task itself, you had to restart the monster and after a couple of hours my arm and shoulder felt like they would fall off. The whole job would take the better part of two days and the beast rented for $80 a day! Then Mrs. Phactor made a deal with some garden fairies that in return for leaf cleanup, she'd do their tax returns. So much to my total delight, TPP arrives home yesterday and the lawns are free of leaves! This was magical and my right shoulder has stopped its anticipatory aching! You should understand that TPP knowing quite well which side of the bread is buttered always, always gets Mrs. Phactor a compensatory gift just this side of extravagant for relieving her doltish husband of any tax return responsibilities. This coming year her deal with the leaf fairies will have to be taken into account as well. It's midterm and TPP gave an exam today. These events are deadly to the grandparents of students; two of them died. And another fellow showed up appropriately winded to declare that he'd just gotten back from the police station. "Released on your own recognizance?" What? "You made bail?" Oh? Oh! Ha, ha, no; I was reporting a break in and theft. And my homework was on my laptop that got stolen. "But of course you have a backup." Uh, no. "Good thing you don't have a dog that could have eaten your stick memory." Oh, no, another was delayed arriving back from home by a flight cancellation. So many calamities, and just because of an exam. And this is out of just 24 students. It was the big lecture classes that gave me gray hair. Our urban estate attracts a lot of wildlife because it's got cover, water, and food, some natural and some supplied by TPP's garden, and some offered up because we're good hosts. This time of year is quite busy especially for our avian wildlife because transients combine with natives. A mixed flock of finches, mostly gold, some house, and maybe a pine siskin or two, have descended upon us, a ravenous horde that can empty a feeder in a day. Standard nuthatches, Carolina wrens, and brown creepers are year around residents, but two or three pairs of red-breasted nuthatches have arrived within the last couple of days and they are very busy birds unable to wait even long enough for you to put seed in their feeder. The first juncos have arrived and will remain all winter, but the white-throat sparrows they arrived with will just be passing through. Chickadees, pairs of downy woodpeckers, and even red-bellied woodpeckers are also being quite active. For a few rare moments virtually all of these were visible from our kitchen table at once, and maybe even a cardinal or two, and then they all scatter when a blue jay screams its arrival. And lurking around all this little bird activity are our local Cooper's hawks, one of which was chasing squirrels around one of our oak trees. Go hawk, go! Although they are indoor pets, the kitty girls watch all of this like excited kids in front of a TV. To put the final touch on what has been a tough year, here's a Friday Fabulous Flower, only one day late, which have been in short supply the past few weeks. What's interesting with monk's hood or wolf bane (Aconitum) is that while it is almost always the last species to flower each season, this year it waited until October 26th to flower. In fact sometimes you almost forget monk's hood is around as it hangs out in the rear of the semi-shady margins of our gardens. It's a great looking plant in flower and a member of the buttercup family. Now that the season is really over, we'll have to recap the garden flowering log and see how flowering went this year overall. It wasn't the best of weeks nor the worst of weeks, but it had its combination of good and very depressing news. In other words it was like many other weeks except a bit more extreme in terms of the highs and lows. Our fall color has largely moved from the crowns of our sugar maples to the lawn, now a deep pile carpet of orange-gold leaves. The oaks remain reluctant to play along, but nothing new there. A few shrubs still display some nice color, but it won't last long. Having narrowly escaped frosty nights a month ago, some harder frosts are in the immediate offing, maybe tonight, but no matter what, the window box petunias, still looking marvelous here at the end of October have certainly set a new endurance record. However, without doubt it's time to bring in the bonsai figs, which while tropical seem to like a bit of cool weather. Lots of the tropicals brought in month ago have responded with flower buds. The real depressing news comes from the publishing side of scientific life, but nothing that cannot be fixed with the expenditure of a lot more time and energy. But if it were easy everyone would be doing it. On the other hand a connection was made with an Asian colleague doing some similar research and clearly we will gain ideas from an exhange of experiences. It's always nice to interact with other biologists who are interested in the same things you are. Midsemester evaluations for students was also a mixed bag covering the full range of achievement from excellent and impressive to "you want us to do what?" TPPs response is that doing anything would be better than what they were doing. So what is needed is a nice large old fashioned cocktail to relax and blog with. With Mrs. Phactor out of town, the F1 and friends will be stopping by for some funky carry-out from a new restaurant in town. Should be fun, and guess who will be buying? Fits the week perfectly. As regular readers know, TPP likes imaginative things made from plants, especially when different species are combined. Here, compliments of the Garden Rant, is a most interesting pumpkin, quite obviously carved in honor of Invader Zim. Honorifics are either generic or specific epithets that honor someone by using their name. They are quite common actually, and sometimes they can be humorous or down right mean. Consider Ruiz and Pavon who named the genus Galinsoga after a Dutch rival saying that the beauty and size of the flower matched his botanical accomplishments, except the flowers were small and not very attractive. So this is pretty funny actually, a new fern genus, Gaga, yes, an honorific for Lady Gaga, and it was done by one of my good colleagues, Kathleen Pryor, in the most recent issue of Systematic Botany. Now they could have done better with the title of the article, “Going Gaga over ferns” or something like that, but it’s still pretty catchy. The resemblance is pretty obvious in this illustration except they are comparing this haploid fern to the diploid singer. HT to AoB blog and No seeds, no fruits, no flowers; no problem blog. Although not implying that TPP would be happy with Chance the Gardener (Being There, 1979), in general, gardeners display many characteristics that you'd like to see in political candidates, characteristics largely lacking. Gardeners know it isn't all about them. Gardeners must have some patience. Gardeners are nurturing. Gardeners know how to tune out the world and just think about things, otherwise weeding and spading wouldn't get done. Gardeners know when to plant and when to harvest. Gardeners deal with the real world, a cultivated world, but still a real world. Gardeners are not insulated, removed, from nature. Gardeners appreciate the little things in life like a really ripe tomato or fresh asparagus. Gardeners don't mind getting their hands dirty. Would not it be nice if more politicians were gardeners, but for some reason people raised as gardeners never seem to have the flawed egos that seek political power. Instead our politicians are that type of suburban, generally worse than urban, person that treats their house as an apartment that inconviently has a yard around it. If they grew up in a rural area, they sought to "escape" as soon as possible, although liking to brag about their "roots". In this regard we have no candidates of any merit. TPP fears that all of them would need instruction to lay sod; green side up, fellows. So it turns out TPP is a values voter, but apparently a gardener's values are not much in demand. How depressing this all is. When you get desperate enough, cost becomes no object. Well, price is an object, but you don't mind spending a premium price to get what you want if there's no other way to get it. In this particular instance TPP and most especially Mrs. Phactor want Northern Spy apples. Usually we can get some at a boutique hobby orchard about 50 miles away, but this year an early warm spell followed by a freeze doomed the local apple crop almost totally. Our favorite source in Michigan had a poor crop of this variety and are sold out of what they had. So some online shopping identified a source not too far from where TPP grew up in upstate New York, some real apple country. Now it may sound ridiculous to pay $100 for a bushel of apples, but these are Northern Spys, and if you think you know quality apples and haven't tried one of these, you are in for some revisions. They are crisp, firm, juicy, sweet-tart, and have a complex apple taste. They store well and stand up well to baking. They are Mrs. Phactor's favorite pie apple. Of course if you think about the alternatives, the price isn't so bad. Alternative one: do without. Not a good alternative. Alternative two: drive to Michigan on an apple quest. Estimated cost: fuel $80, meals $60, lodging $80, apples $35, two days required. Now of course there are other pleasant things associated with the trip (wineries), and the load of apples would be considerably larger than a bushel, but in general TPP is feeling pretty good about this purchase, its delivery to his door, and a piece of apple pie will make him feel even better. BTW the Northern Spy has been difficult to grow, but now a dwarf variety is available, the Nova Spy, and the apples have retained the Northern Spy quality. Can you eat flowering kale? A curious reader wants to know if you can eat flowering kale? Yes. That was easy. Flowering kale differs from regular kale in having short internodes so the leaves make a dense rosette of leaves. It also forms pigments, or not, often in the leaves in the center of the rosette, so the overall effect is that of a flower, sort of. Nonetheless, just like garden kale, flowering kale is quite resistant to cool weather and frosts providing garden color and design when most things are going dormant for the winter. In fact kale is actually better tasting after exposure to some cold temperatures. You can eat flowering kale just like regular kale. One of the best ways to use kale is in soups; here's one example, a Portuguese kale soup. HT to Jardin botanique de Montréal for making this picture available via the Wikimedia Creative Commons. Not everything is black and white; this is! OK, what's black and white, cute as all get out, and hangs around on Mondays munching bamboo? Here's a dose of cute to chase away the Monday blahs. The GnOPe of Lincolnland wants my vote; not for anyone in particular, not for any particular issue or agenda, just in general, more or less for everything. In fact the missive sent to me only features one word in bold, red letters: LIBERAL. Yes, vote against anything liberal; vote against the liberal agenda; vote against Washington liberals (if only we really had some! ); meaning vote for the GnOPe. Personally TPP is insulted. The GnOPe seems to think that the word LIBERAL will affect me the way SQUIRREL affects dogs in the movie UP. Well, TPP has stopped associating with the GnOPe since they became the party of stupid. Since TPP is not alone, quite likely this message resonates quite well with their party's present main base, but liberal doesn't mean what they think it means. TPP has long embraced a liberal philosophy of equality and justice supporting free and fair elections, freedom of speech, religion, and press, a right to life, liberty, and pursuit of happiness. If the GnOPe is serious about opposing a liberal agenda, then they should be more specific about which of these rights and freedoms they wish to limit or take away. Oh, yes, in a manner of speaking all of them, for one group or another. The GnOPe doesn't want minorities or people who vote against the "conservative" agenda to vote. The GnOPe doesn't want women to have any rights at all. And freedom of religion is OK as long as it's the right one, and now even this is pretty confusing for the them trying to convince the religious right that Obama is the wrong kind of Christian while at the same time sort of side stepping the issue that Mittens isn't any kind of Christian at all by their own standards. Ironic isn't it? The original tea party was protesting the lack of representative government, and now the Tea Party embodies the biggest threat to our constitutional rights in the history of our republic. Before receiving this missive, TPP was considering voting for at least one GnOPe candidate for state office, by all accounts a reasonable fellow, but how can he be reasonable and still be part of a stupid party? Recalculating, recalculating. The Phactors host visiting foreign students regularly. One liked us well enough to return for a visit and she brought us some fancy and rather exotic spices, so how about some suggestions on how to use a couple of these items. First are peri peri peppers, which is doubly redundant because peri peri means "pepper pepper" literally, but probably better translated as "little pepper", which they are, one of the many varieties of little, often appallingly hot "bird" peppers so-called because birds disperse them. The Phactors have quite an array of chili peppers around but mostly of the Tex-Mex sort, so peri peris are rather new. 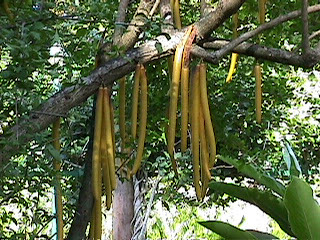 Another spice, and a new one on our lengthy life list, is cinnamon flowers, which can also be called cassia buds, but then again cassia is a type of cinnamon. So this is either a flower bud or very young fruit. They look rather like cloves, which is also a flower bud, but they are even harder. An exploratory chew found them to be a hot, spicy, cinnamony, and sweet, sort of like a red-hot candy. So what do you do with them? One new addition to our gardens, a weeping black tupelo (Nyssa sylvatica - "Autumn Cascade") not only survived the hot, dry summer in good condition, but its fall color is quite spectacular although its still pretty small. This tree is not as weepy as some weepers, and it will produce upright leaders so you can control the upward growth with judicious pruning. Our specimen sits at the back of a perennial bed where we want it to be a small specimen tree. So far its been trouble free and fast to establish itself. The semi-weeping habit will help keep its size in check. In this location our tupelo gets 5-6 hrs of sun which seems sufficient. And then there's the color. Tupleo's have great fall color and this variety does not disappoint. TPP highly recommends this tree as a way to enhance your garden. For the longest time TPP has loved his BikeE, but here's an E-bike that is very cool, and very cute. It's an all electric bike. Notice the lack of a chain. Pedalling just charges the batteries so you can go longer between charges, or don't pedal, but you never have to worry about getting chain grease on you pant leg (a BikeE problem). It's small and foldable so you can take right into your office and not have to worry about having it ripped off. This is definitely worth looking into. If you have one, let us know what it's like. How can they do these things without alerting TPP? October 11 was Tree Diversity Day and who knew? Biodiversity International didn't put anything on their webpage until Oct. 18th. Nothing would please this blogger more than to support Tree Diversity Day, but someone needs to figure out PR because clearly the information highway was moving pretty slowly on this one. Well, better late than never. Here's a tree that might be new to you, a celebration of diversity, the candle tree. 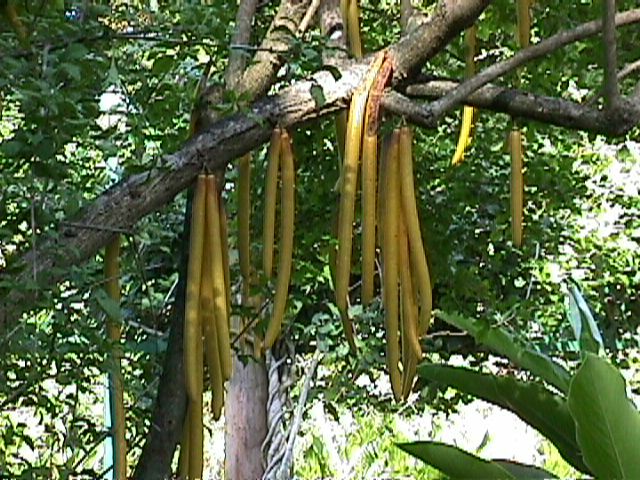 The long (up to 1 m), fleshy, many-seeded, yellowish fruits are quite distinctive (and unusual in this family) and supposedly edible, but TPP cannot verify this. Like many tropical trees Parmentiera cereifera (Bignoniaceae) flowers on old wood. The flowers are large, white and open at night, and that along with the floral shape, and other features (thick flower stalk, buldge on lower side of perianth to hold nectar) clearly indicate pollination by nectar-feeding bats. Here's some fall color TPP spotted on his walk home today. Fall color around here is just about at its peak and the weather is doing its best to make the display short-lived. This display caught my eye and then came the recognition. 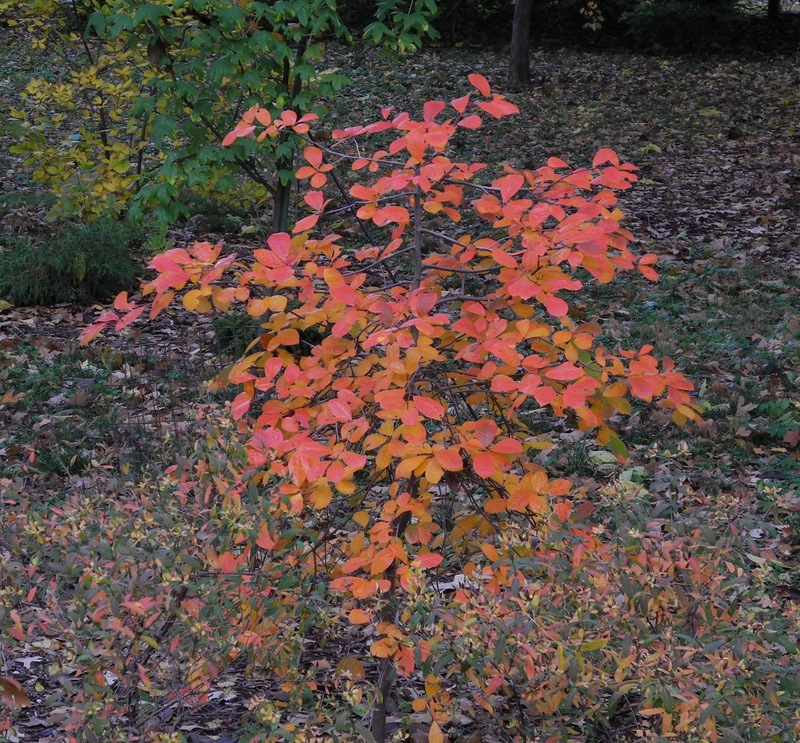 In general sumacs do have great fall color displays, but you seldom think about this species has having great color, but here you are, Rhus toxicodendron has great fall color even if it gives you the creepy crawlies. OK kids, go on out and collect some nicely colored leaves. Now if you really know your stuff about plant interactions, you'll tell me what tree this vine is growing on. For some reason these two species always have gotten along. Walking to and around a college campus can always be a bit challenging for about 15 mins each hour as classes change, but walking is made more difficult by the many iPhone zombies. These zombies are so absorbed in the little screens in front of their noses that they shuffle and stumble along with no regard whatsoever for those people or other objects in their path. On occasion one will look up surprised, briefly emerging from zombiedom, to discover that another person has happened into their wandering path. Curbs and uneven sidewalks become challenging obstacles for their shuffling gait. Some of these zombies compound the problem by chewing gum thereby certainly putting them into a mental overload. Some students attempt to secret their obcession behind books or papers to maintain the zombie status during class, and this certainly shows up in academic evaluations. It's actually a new form of absenteeism, your zombie body attends the class, while their brain is being consumed by their iPhone. "But I attended every class, how could I get a D-?" A colleague actually arranged to have his class texted during his class to say the lecture isn't being texted to you, so turn your phone off. One answered, "Y not?" TPP is looking for a personal signel jammer to fight fire with fire. Oh, yes! A 10 meter range! Now for some fun. Today, October 16th, is World Food Day, and TPP has a spectacularly inappropriate lecture and lab today: sugar. Sugar is not actually food. Sugar is not needed for a healthy diet, although some sugar-containing foods (fruits), some roots, are parts of healthy enough diets. And yet we like sugar. Here's several things to think about. That sugar in your sugar bowl is 99.99% pure sucrose, probably the chemically most pure substance in your house, and what it actually represents is solar light energy stored in the form of chemical bonds. No wonder a bit of candy can brighten your day. Our instinctual like for sugar is perhaps linked to choosing ripe fruit as a good candidate for being safe and nutritious food. Other than honey, glucose secondarily from plant nectar, sugar is pretty hard to find in nature. If remembered correctly dates have the highest sugar content of all fruits, basically a self-preserving fruit. Did you ever wonder how the sense of taste works? Sugar sensors on your tongue detect certain soluble carbohydrates when the molecule fits into a receptor site somewhere on your taste buds and a signel is sent to your brain identifying a molecule with a particular shape as "sweet". Sweetness is a molecular shape. Even some sugars, e.g., lactose, barely trigger you sweet sensors, so that sugar isn't sweet. And sucrose tastes sweeter than maltose, and fructose tastes sweeter than sucrose, so supposedly the better the molecular fit the sweeter the taste. Artificial sweeteners work because part of their molecular structure mimics the shape of sugar and triggers the taste sensors. A few plants use non-sugar sweeteners to make their fruit taste sweet even though no sugar is present. The sweet taste of Stevia leaves is produced by a protein. This is sort of fun to know: the word sugar is derived from an ancient word in Sanskrit for sand, "sakkara", and even more fun, candy comes from another word in the same language for pebbles, "khandra". No question about it, raw, "brown" sugar looks like sand and pebbles. And lastly way too much of our food has sugar added even if we don't think of it as sweet. Of course there is the wretched excess of breakfast cereal that isn't just sugared, they have become predominately sugar, but even things like pasta sauce often have sugar added. TPP seeks out the brands that don't add sugar because you don't need sugar. Pasta sauce tastes better without it, so don't train your taste buds, or particularly those of your kids, to expect sugar in everything. Remember, sugar isn't food. This is pretty cool way to image plants. Positronic Emission Tomography, of course, and everyone knows what that is. Why you get your tomographer out probably every weekend unless you happen to be short on positrons, the opposite of which is bad vibes, man. Us low tech guys can definitely see the value of this research, but do you think he can get this rig out into the field? Here were the main activities of the weekend for our household. 1. A virus, how annoying. Not TPP, his trusty PC. It has been a good long time since it has contracted an infection, and you get rather complacent, but fortunately most software has automatic updates although no anti-viral or anti-malware installed saw this one coming. And from where? It was the usual scanning for science news and recipes type of morning. Should you be ever suspicious of squash soup recipes? And for all my years on the internet, and it is many, what is the creator of such malicious software gets out of it. It’s like breaking windows. Other than a delight in sheer destruction of something not so difficult to break, a feeble victory at best, and annoying people you don’t even know, where is the payoff? 2. Leaves. Just as the fall color really begins to appear a 24-hr windy front moves through the area and reduces tree crowns by 50%. On the good news side, a newly planted tupelo is showing real potential for outstanding fall color. On the other hand, drought damage has greatly reduced the fall color of the witchhazels. And of course, all the leaves in the world seem to end up in the lily pond. 3. Rain. After a brief effort, maybe about 150 bulbs got planted. Probably 1.5-2 inches in total. So the default activity was house cleaning, an activity largely ignored during gardening season. Why clean a house if you’re only going to be in it to sleep? Somehow quite a layer of dust and cat fuzzies had managed to accumulate, and we do expect a foreign house guest later this week. 4. Garden cleanup. Time to ditch the summer garden plants; nothing more to come from tomatoes (3 cherry tomatoes eaten on the spot), peppers, beans, eggplant, okra. At least when your garden is close to a total flop you don’t have much to clean up. Only the cold frame greens remain. Made a totally dynamite spicy pork and bok choi stir fry, and it was fairly easy and delivered a Thai flavor. Definitely a keeper recipe, one of those sleeper recipes that you turn past in a cookbook because it never quite captures your imagination until you have a bunch of bok choi and some frozen coconut milk to use and your pragmatism turns to discovery. 5. Bonsai trees. Several of TPP’s bonsai trees are pretty tough and seem to do better is given some fall cool weather, but there is a limit so the indoor migration began. The Pittosporum needed repotting, and that was completed just before the next big squall came through and TPP had to help the neighbors secure their garden shed (plastic on tubular framework) that had gotten blown over by a sudden gust. The limb cleanup will result in a substantial pile for composting as it always does. Uh oh! Honey dew weekend! This is not a good sign. Mrs. Phactor is on the patio and the table is covered with various bags and boxes of bulbs. In the spring bulbs are great; in the fall they make my back ache because they need to be planted. The first couple of hundred go OK, but then it gets to be work. A 3-year plan to eradicate lily of the valley under a big burr oak and plant a sward of English bluebells is in it's final year. This will be a tiny version of the planting in the Brooklyn Botanical Garden that inspired this action, fall out of Botanical Geek Tour #1. So if TPP spends too long with this blog things will begin to get ugly. Last weekend the monsterous elephant ears by the pond were dug, and now it looks funny because those huge leaves, over 6 foot tall, made such a presence, now some new perennials will be planted. A bed of tall, purple leafed cannas must be dug so a couple of hundred tulip bulbs can be planted. While the weather has been very much fallish for three weeks now, cool at night, flirting with frost but not quite getting there, so the cannas still stand tall, so that means some massive rhizomes are anchoring the whole bed. At any rate somewhere there's a shovel with my name on it. And come spring, today's work will look wonderful. And mocking me from the adjacent kitchen chair, one of the kittygirls is looking quite smuggly comfortable. Unfortunately the weather is iffy and rain threatens to change our plans. So if it rains Mrs. Phactor will probably want to go and buy more bulbs. The C (ronk) HE is a favorite news organization for what's happening now in higher education. This news source recently announced that a recipient of a Templeton grant would attempt to answer the timeless question, "How much wood would a woodchuck chuck if a woodchuck could chuck wood." This would be really funny if it weren't so close to the truth, which is what makes it so funny. Oh? Oh! Templeton here we come! Who knew? A highly significant correlation exists between a country's per capita consumption of chocolate and the number of Nobel prizes won by citizens of that country. Naturally out there anchoring the upper end of the regression is Switzerland, the country that put the milk in milk chocolate (the Peter process) at a chocolate consumption of about 11 kg per person per year. That seems like a lot until you see the Easter display at the Sprungli showroom in Zurich featuring a 4 foot tall chocolate egg with an entire chocolate diorama inside. So if a country wishes to increase its number of Nobel prize winners it must simply encourage its citizens to eat more chocolate (0.4 kg per person per year to be exact) to increase the number of awards by 1. That big rabbit in the back would be a good start on an individual basis, but for the USA it would take 125 million kg/yr in total. Who wants to make this much of a sacrifice? Lincolnland requires all its employees to have annual ethics training. Without question there are many ethical issues that confront university faculty; too bad the training has nothing to do with these situations. You see the dummies that construct the training modules don't know anything about universities other than the business side of things, so the training modules ignore them with one single exception in this year's training, whether it is ethical to accept a gift from a student. The majority of the training module concerned interactions with vendors. Clearly important, but nearly irrelevant for faculty. TPP also has one major concern and that is the state and its universities claim to have the right to prevent you from accepting any outside employment. In other words, to work a second job, TPP needs to ask their permission. This is pure bull. As long as TPP functions such that he fulfills his contractual obligations to the university, they have no compelling reason for having such power. Can TPP review this textbook? Can TPP write a book? Really? When your regular job duties take way beyond the official 37.5 hour work week, the university has some nerve suggesting that they have the power to decide what else may or may not be done with your time. If they can't control how many hours are spent volunteering or on a hobby, or reading or watching reality TV, then how can they restrict paid activities particularly before they ascertain whether they interfere with your university job? So no, even though technically unethical, this faculty member will not be asking permission for paid outside gigs, if such gigs actually exist. It's a matter of principle. That and thousands of hours of unpaid overtime. Here's a nice post about the citron, not one of the more popular, well-known, or useful of citrus fruits. At times it's tough to know what fruit or plant ancient texts are referencing, but if you like this sort of thing, you might see if you can round up a copy of Michael Zohary's Plants of the Bible published about 30 years ago, or a number of other similar books. One of the primary goals of teaching economic botany is to put a lot of new things in front of students, strange and wonderful things, new things to tickle the old curiosity. The problem is that you never quite know what will and what will not be amazingly interesting. Today's lab topic was legumes. While shopping last night TPP was quite surprised to see fresh faba beans something he's never seen in local markets before. Well, the students will have fun with those thinks he, but little or no interest in such a novel item, although a colleague passing through the lab took time to open a pod and mess with the huge bean inside. Today's smash hit, a double header actually, were spicy masala peanuts from an Indian grocery and jicama. Jicama (HIH-kah-muh) is a pretty unusual vegetable from a bean, the yam bean, in a family largely known for fruits and seeds. These large "tubers" or rather a fleshy storage root has quite tasty, crunchy flesh; you peel off the corky skin. Makes for a nice alternative to carrot sticks or in salads for "clunch". For reasons that cannot be explained this was a big hit with this year's class. 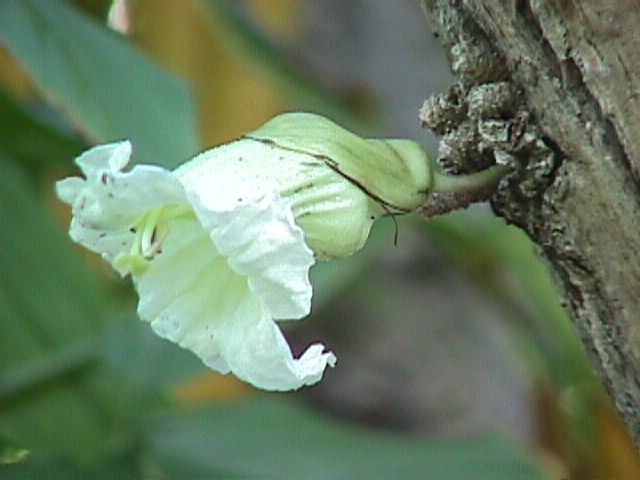 The yam bean (Pachyrhizus erosus) is a neotropical native, a vine with perennial storage root. Look at the generic name; pachy = thick (pachyderm - thick skin) and rhizus = root, pretty descriptive. The quick lentil curry was largely consumed as well, of course, when you lab meets just after lunch, anybody who skipped eating is well prepared to try something new. TPP is proposing a new scientific term “Brounian movement” – the directional movement of science from its current state of knowledge to that of the dark ages. Now the fact that Paul Broun thinks evolution is a “lie straight from the pit of hell”, thereby making biologists such as myself demons spreading Satan’s message, is no big deal because every culture has its atavistic knee-biters, but this fellow is a Republican (no surprise here) congressman, running unopposed for re-election, and here my fellow residents of the world it gets worse, and for this TPP feels the need to apologize for our culture, not because of what it is, but for the undue influence it has on other citizens of the world, because this guy and a bunch of other Bible beaters are members of the House Committee on Science and Technology. Yes, about 25% of this committee are religious fundamentalists who deny science. Sorry, world. People in the USA put foxes in charge of chickens. One of the problems with our culture is a deep seated anti-intellectualism that thinks good-old-boy street smarts is just as valid as science. So please, do not look to the USA for much leadership, for much creativity, for much forward thinking, because just as in other countries that we too often denigrate, way too many of our citizens would sell democracy down the river for a theocracy, so long as it was their theology. What do you say to people who say evolution is a lie straight from the pits of hell? TPP can think of nothing that would make an impression on such a mind set. Along with my colleagues we set down the botanical perspective on evolution. What part does Congressman Broun think is a lie? Natural selection? That’s only been demonstrated a few thousands of times. Do they think descent with modification is a lie? Then why does every data set, all kinds of fossil data, and all kinds of developmental studies seem to fit with descent with modification? And as for the Earth only being 6000 years old, well good luck with that one. Broun claims that as a scientist, something he isn’t although he has science degrees, he has seen evidence of a young Earth. Want to bet? The only geologists that might agree also think the Earth is flat. In fact so much evidence exists it is perfectly reasonable to say that people like Broun are cranks, people who stubbornly refuse to acknowledge that science knows anything, until he needs an antibiotic. So sorry, my fellow citizens of Earth. The USA may well be letting you down in the area of science, not that there are many shining examples of really scientifically literate countries elsewhere around the world. Religion holds such a sway upon minds that they are unable to appreciate or accept what is known. How depressing. Now why didn’t TPP think of this? Using gutters to make hanging containers for gardening is just so obvious. One look at a couple of our old gutters with the maple seedlings sprouting forth should have been the inspiration, should have triggered a creative idea, but instead it was just a damn the gutters need cleaning reaction. The cost is minimal. Gutters and gutter hangers can be purchased at just about every hardware store or home maintenance box store. Truly this is one of those good ideas. In particular the idea of picking salad greens without bending over is compelling. If you try this, or have tried this, tell us about your experience. Yesterday, while cruising a local nursery for late season bargains, the Phactors encounter a little shrubby plant with lavender flowers, and what was pretty interesting was the TPP had never heard of it. Didn't even know what family it was in, even with flowers, and that's unusual. Leptodermis oblonga. Hmm, so who do you call? Dirr! But this plant is not in his Manual of Woody Landscape Plants, the Bible of woody ornamentals here in eastern North America. Not in Dirr? So what is this thing costing $14.99 minus the late season discount. Dwarf lilac shrub? Olive family? Well, it has opposite leaves, but otherwise not a good fit. The resemblance to lilac is superficial at best, the flowers are tubular and pinkish purple. Turns out this genus is in the Rubiaceae, the coffee family. That explains a lot because while tropical species look rubiaceous, native species for us are smallish herbs that don't look like typical rubiads really. Now the key thing is always cold hardiness and supposedly this species comes from Northern China and hardy in zone 5, unless they lied or unless this is an alpine plant, which while cold hardy will literally burn up in our Midwestern summer heat. Probably not an alpine from Northern China, especially as an upright little shrub, so having passed the critical tests, and having a spot for a smallish shrub, we bought one. Anyone out there with any experience with this species? Anyone from Northern China? It was a bit crispy last night with a low of 33 F, 1 degree above freezing and a frost for all the literate people out there who the C scale. This is a little bit early for a frost, but not much. The close call was that TPP forgot that he needed basil for a salmon marinade this morning, and there are very few plants that are more sensitive to frost than basil. So our dinner party dodged a culinary bullet. A bit of bok choi and lettuce are all that remain in the garden with any potential, and they are comfy in their cold frame. The sugar maples are beginning to show some color and the sassafras in the far back corner of the estate is already a nice orange-yellow. A newly planted tupelo is beginning to show promise for being a colorful fall plant. Six foot tall elephant ear and cannas still stand tall and will until we get a real hard frost, or until the Phactors get impatient and just decide to dig them anyways. TPP is not real keen on more digging. Our field work has already involved way too much digging to suit my aching hip. So now it's time to swing through a farmer's market, pick up a couple of new shrubs, and finish up preparations for the dinner party which includes a chocolate cranberry tart. Please understand this. Nobody, nobody dislikes exams more than faculty. The reason is simple. Exams are a huge pain to evaluate fairly, and the results can be so discouraging. You have to be quite careful to evaluate student work in a non-biased way. You don't want who the person is to matter. And you want the evaluation of each item to be independent of all the rest of the items. TPP does this by folding the name out of sight and evaluating each question as a class set. First, based upon the material covered in lecture, lab, and their textbook, a decision is made about what a good answer should include, so, for example, you might decide that the correct species name is worth 4 of the 10 points. Then several responses are read to see if any of them approach the ideal response, and if at least one does, then the rest are evaluated coming back to the first ones read last. Then on to the next question. You do understand that this is not a multiple guess exam where the student simply tries to recognize or guess (1 out of 4 or 5) the correct response. It's blank paper. This way TPP has no idea how someone is doing until the very end when the points are totalled up. Sometimes it seems things are going badly, like this 1st exam just recently graded, but the average grade was 75.5, one-half point above the B-C border line. However as always it's the extremes that make you very happy or very sad. People who score more than 20 points above or below this average are either doing great or very poorly. Sometimes the reasons are clear. One student with an attendance record of almost exactly 50% got exactly 50% on the exam, which seems a very symmetrical result. No you can't have any extra credit until you take advantage of all the opportunities offered already. Scheesh! What fun. Not. All of a sudden crazy bike ideas are appearing all over the place. So what has we got? In the biomaterials category, there's a bamboo rickshaw that is rather aesthetic and terribly cute as well. How practical is it? Hard to say. Besides getting a student to do the pedaling is tricky, and unless you've lived in Asia for some time you probably just don't get pedal cabs or rickshaws. At least with this design you aren't looking at the driver's behind. Here's a really cool looking bentwood bicycle that also has great aesthetic appeal. This thing is a fix-gear bike with no brakes, a concept TPP has a hard time wrapping his head around, just as using this bike will probably result in wrapping your head and beautiful bike around a tree. Still the economy of the design can be appreciated as well as it's furniture heritage. Lastly, the weirdest entry of all, a seat-less, pedal-less bicycle and somehow you just feel this can't actually work all that well even though it's certainly creative. Just thinking here from the male perspective, this doesn't seem to be any improvement in terms of comfort upon the way too little bicycle seat. And where's the coffee cup holder? Do short people just dangle lower? Reminds me of the landstriders from Dark Crystal. The first thing you need to understand is that the Universe is big, really big, you can’t wrap your brain around it big. Even though most of our species doesn’t want to admit it, some attempt to grasp just how small and insignificant we are on a cosmic scale is a remarkable intellectual achievement. Probably this is an affront to the ego of many who gain their sense of superiority by stepping on ants. So here is a link to a new deep space image that shows a galaxy whose image isn’t just long ago and far away, it is at present the longest ago and the farthest away thing ever seen. The Hubble ultra deep field is another image you get by taking a very long exposure on a portion of the sky not occupied by stars in our own galaxy, and the amazing thing is that this view, one tiny little segment of the sky shows over 200,000 galaxies, a view that represents just 0.004% of the sky. You do the math. Does this give you a new perspective on what BIG means? How amazing that from our teeny tiny mote we know about this. Now think about that ant's perspective, and step carefully. Each year for Darwin's Birthday party, TPP puts out his Darwin library for students to peruse, and Alfred Russel Wallace's Malay Archipelago is put out too. The Malay Archipelago is Wallace's "Origin" and it is a worthwhile read. Wallace is a curiosity to my students, and most of them have never heard of Wallace showing just how badly the historical aspects of science are being neglected these days. Well, good news, everyone! All of Wallace's publications are now online and available for free. Such a deal! As my regular readers are well aware, TPP finds all the creative things people do with plant materials fascinating. In past blogs you’ve been offered carved pumpkins, plant birds, and watermelon flowers. This fellow, Shawn Feeney, goes a step beyond by carving a series of watermelons into a cool Chinese dragon. How neat is that? The Phactor has been pretty lucky that his pursuit of botanical scholarship has taken him to a lot of really neat places. 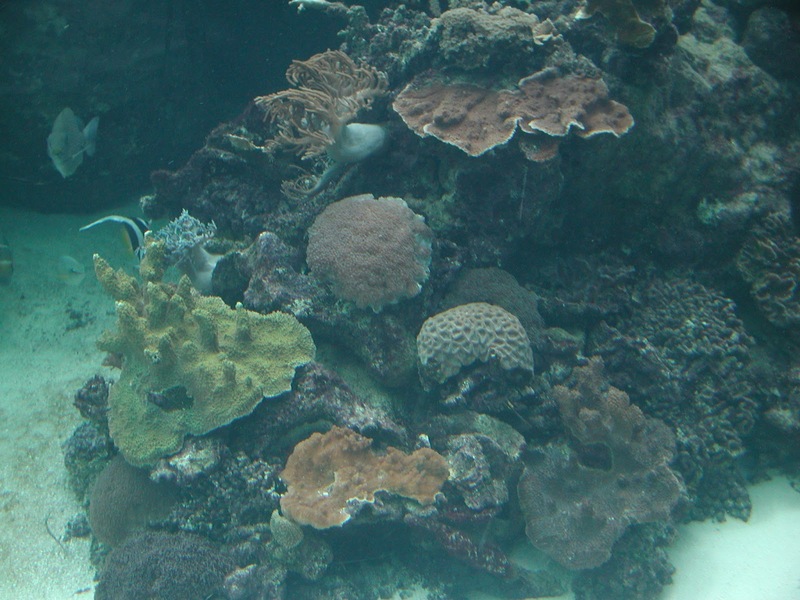 If remembered correctly, TPP has visited the Great Barrier Reef five times over the past 25 years. Coral looks pretty tough, but actually it's pretty sensitive to things like silt, too many nutrients from agricultural runoff and increases in water temperature. When that happens corals expell their algal symbionts, and the result is "bleaching", which makes corals very sensitive and often leads to their death. Episodes of bleaching have been recorded on reefs around the world periodically, but now a new analysis indicates that roughly half the coral cover of theGreat Barrier Reef off the coast of Australia has bleached and died, and it did so in less than 30 years. In comment w00dview captures what a lot of us are thinking: "You know, I honestly wished the deniers were right. I wish climate change was a big hoax and the evil doers were arrested and everything was just hunky dory. I wished they fiddled with the data. The pictures of the melting sea ice were just meticulously photoshopped and polar bears were doing great. I wished the deniers were actual sceptics who had a convincing, coherent alternative hypothesis as to what is happening out in our atmosphere. I wished there was a great cabal of immoral scientists blocking dissent and even controlling the media to show us all these images and news of the damage that is already taken place. I wished Climategate actually showed up irrefutable evidence that we were being taken for fools. I wish that the seas were not being threatened by ocean acidification. I wished that some of the most beautiful, complex awe inspiring and vital ecosystems were not under threat from the fossils fuels we burn. I’m sure climate scientists wish they were wrong too." Sorry you found nothing edible in that pot of petunias you dup up yesterday. Such a waste of effort even now as the petunia season is drawing to a close. Perhaps you did not notice that the petunia was still flowering nicely. And the management would like to point out that you found nothing in that pot the day before yesterday, or the day before that, or the day before that. Without doubt the digging is easy because the potting soil is so much nicer than our clay laden midwestern soil, but the ease of effort does little to enhance your rate of success. Clearly such futile foraging behavior is not diminishing your Darwinian fitness or the stupid-pot-digging genes and this greatly saddens us because you have not proven to be quick learners. So try to understand our feelings about this. After all, weren't we nice enough to give you enough squash seeds to choke a horse? And yet, you still felt compelled to dig up the pot of petunias, again. In the future we may have to resort to tiny land mines or adopt greyhound or get some recipes for squirrel stew. We hope you understand it's nothing personal.